Nintendo dates a slew of upcoming retail and downloadable Wii U and 3DS games. 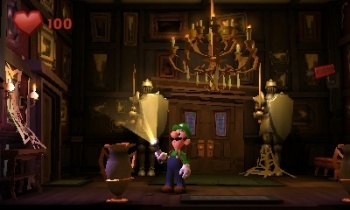 Luigi's Mansion: Dark Moon came as a surprise when it was announced at E3 2011, and since then fans of the GameCube original have been clamoring to get the sequel for the 3DS. Nintendo broke some hearts last year when they pushed Dark Moon from the vague "holiday season" release to an equally vague "spring 2013." With spring only a couple of months away, Nintendo has gone ahead and made it official, giving Luigi's Mansion: Dark Moon a March 24 release date for North America. The news comes out of a press release in which Nintendo details its quarter one line-up for the Wii U and 3DS; along with Luigi's Mansion, more than two dozen additional games will be hitting the 3DS via retail or eShop in the next few months. Among them are Fire Emblem Awakening, which comes out in just a few short weeks on February 4; niche titles Etrian Odyssey IV: Legends of the Titan on February 26 and Shin Megami Tensei: Devil Summoner: Soul Hackers, coming April 16; Castlevania: Lords of Shadow - Mirror of Fate on March 5; and Lego City Undercover: The Chase Begins on April 21. Lego City Undercover is also hitting the Wii U on March 18; jokingly called "Grand Theft Lego" by some members of the press, Undercover was generally positively received at E3 2012. The new Lego title shares the Q1 Wii U line-up with Rayman Legends, which is coming February 26 after last year's delay; Monster Hunter 3 Ultimate and Need for Speed Most Wanted on March 19; and the Bit.Trip series makes its Wii U debut with Runner 2, which hits the eShop sometime in the first quarter. If that's too long to wait, Double Fine's The Cave is hitting the eShop (along with the PC, XBLA, and PSN) on January 22. Maybe that will take the edge off the fact that Pikmin 3, The Wonderful 101, Game & Wario, and Wii Fit U have been pushed out of the launch window and into some indeterminate time in the first half of the year. Though the Wii U hasn't matched the Wii's early popularity, it has a solid line-up going into 2013, though more console exclusives (and less games that are already out for other systems) would be nice to see. Even more impressive, however, is the 3DS line-up; it seems like the handheld is finally getting past its early growing pains. Unfortunately, the press release made no mention of Animal Crossing: New Leaf, so don't expect to see that until the second quarter of 2013 at the earliest.